You've never seen anything like this before! Traxxas innovation takes your racing fun to a whole new level with an authentic, portable, and affordable drag race timing and scoring system. The DTS-1 unfolds and turns any strip of smooth asphalt into your own personal dragstrip. Everything has been scaled to re-create the entire drag racing experience with as much accuracy and realism as possible. The center point is the authentic christmas tree with its super-bright LED display and modern stage light configuration. Dual beams on the starting line allow competitors to pre-stage and stage with laser-precise accuracy. Depending on your quickness and skill, you can select either a Pro or Sportsman tree for the countdown. When the lights go green, the race is on--but don't jump the start or you'll be disqualified! At the end of the track, the finish line beams determine the winner with millisecond accuracy. 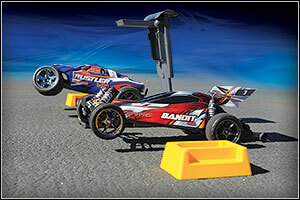 Race up to 330 feet, the equivalent of a 1/4 scale quarter mile. Want even more race data and detail? Use the TQi an Android, iPhone or iPod touch with the Traxxas Link application (all available separately), and the DTS-1 creates digital time slips with your elapsed time, reaction time, and trap speed to a tenth of a mph. 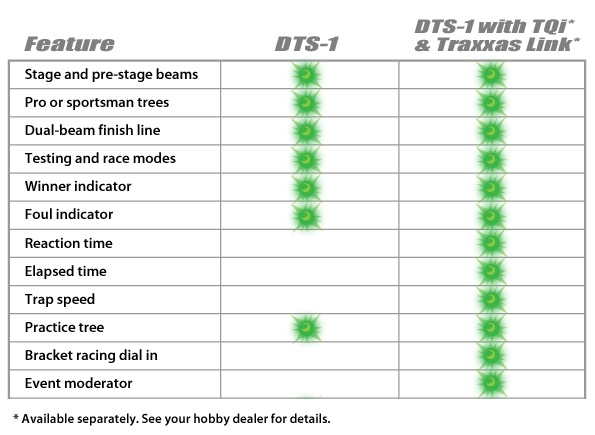 The DTS-1 adds a whole new dimension that takes your drag racing fun to an exciting, full-on simulation of the NHRA Pro Racing experience. Dual beams on the starting line indicate pre-stage and staged status. The Traxxas NHRA Funny Car is equipped with a staging mode that allows the driver to roll carefully into the beams without having to bend down and stage by hand. Drag races are won and lost by fractions of second on the clock. At the finish line, dual laser beams determine the winner within milliseconds. When you equip your model with the Bluetooth module or TQi Docking Base and the Traxxas Link app, DTS-1 displays your trap speed through the finish line beams on your Android, iPhone or iPod touch. Adjustment capability is incorporated into the Staging and Finish Line consoles to allow you to compensate for uneven or sloping racing surfaces. Each of the DTS-1's precision lasers is returned by a highly efficient reflector. Each reflector features a pocket for sand, rocks, or other ballast if needed on windy race days, and the reflectors stack for easy transport. Setting up the reflectors takes only seconds; DTS-1 alerts you by sound and LED indicator when each reflector is properly positioned.